Thanks to Mitra Mehrad, M.D., Barnes-Jewish Hospital, Missouri (USA) for contributing this case. To contribute a Case of the Week, follow the guidelines on our Case of the Week page. (1) In October 2013, we had record traffic of 542,590 visits, averaging 17,502 visits per day (total of 1.5 million page views, 11.9 million "hits"). Thanks for your support and your suggestions! (2) We now list Conferences by subspecialty and by location on our Conferences page. (3) New stains recently added to the Stains and Molecular Markers chapter include FOXL2, GNAS, IDH1, ISL1, SGOL1 and ZEB1. (4) Our Feature Page for November highlights Consumable Lab Products / Clinical Lab Analyzers and includes Leica Biosystems, Sakura Finetek USA and Ventana Medical. 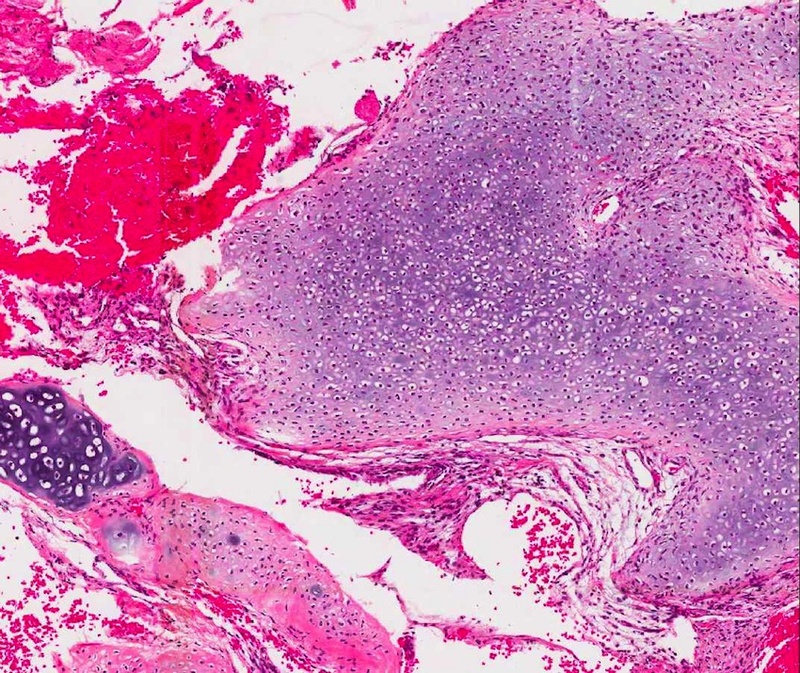 A 47 year old woman with sinusitis and nasal polyps underwent endoscopic sinus surgery. 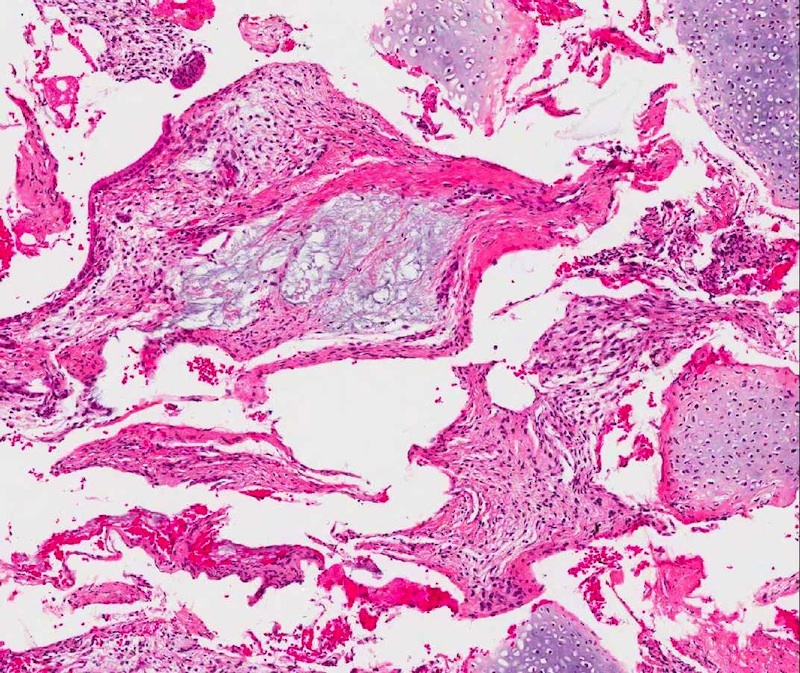 Nasal chondromesenchymal hamartoma is a rare, often cystic lesion that typically fills the nasal cavity and extends into the ethmoid sinuses. It was first reported in 1998 at Barnes-Jewish Hospital (Am J Surg Pathol 1998;22:425), where this Case of the Week originated. It is considered an upper respiratory tract analogue of chest wall mesenchymal hamartoma. Although benign, it may erode the cribriform plate, and have an intracranial component. It is more common in males (2/3), and typically affects children, with a mean age of 14 months. Reports in adults are uncommon (Arch Pathol Lab Med 2005;129:1444). 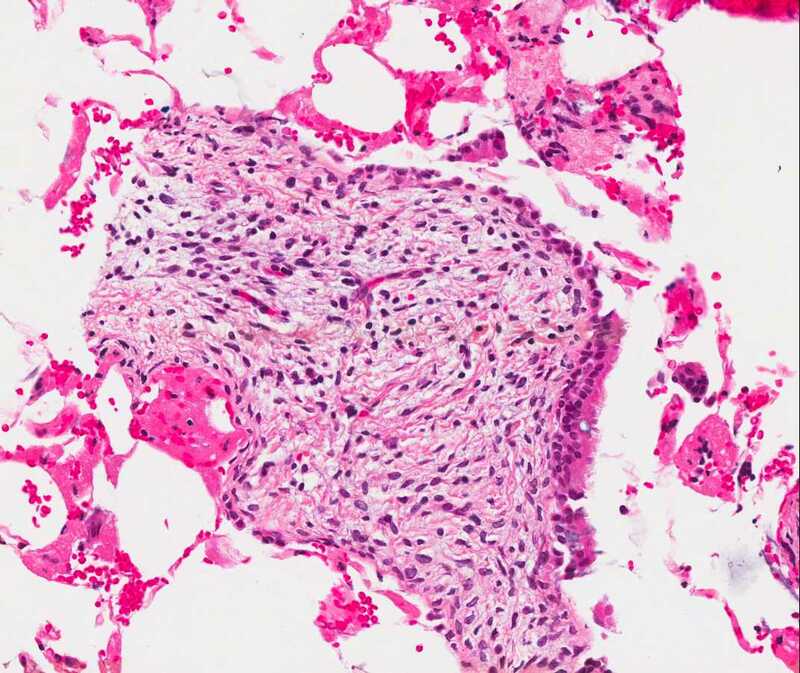 It is occasionally associated with pleuropulmonary blastoma (Int J Pediatr Otorhinolaryngol 2010;74:1240). 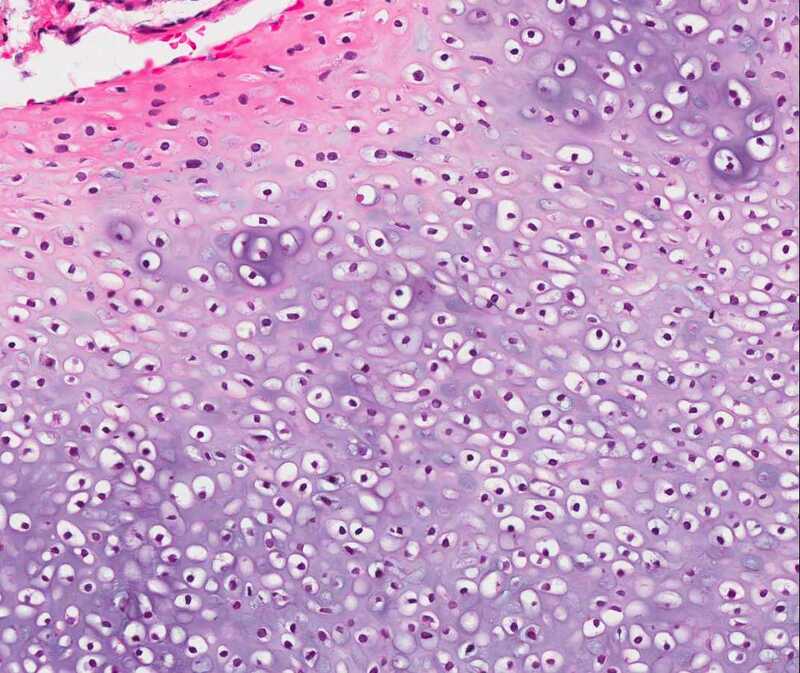 Histologically, as in this case, there is well demarcated mature cartilage, myxoid stroma and spindle cells. 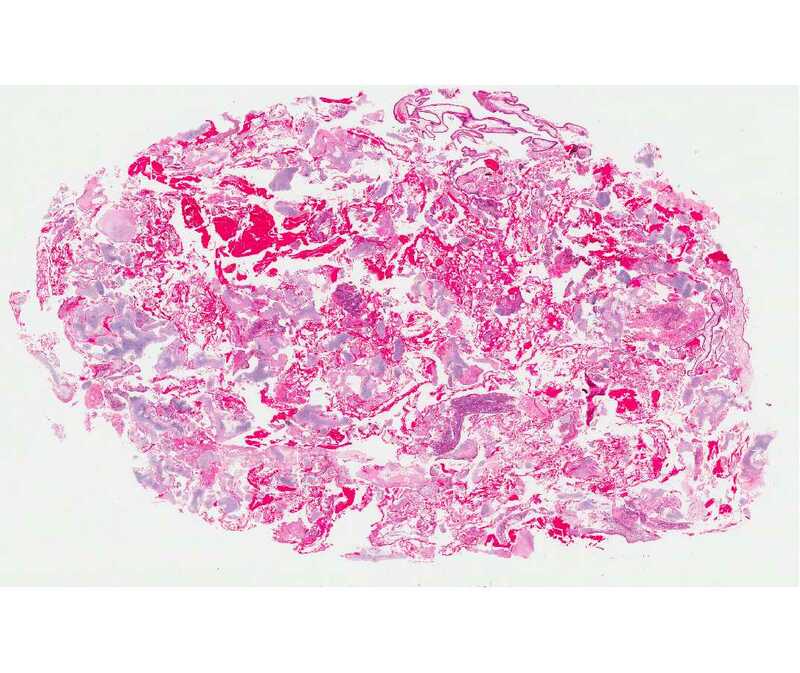 There may also be focal osteoclast-like giant cells, aneurysmal bone cyst-like formations, and collagen fibers (Arch Pathol Lab Med 2001;125:400). 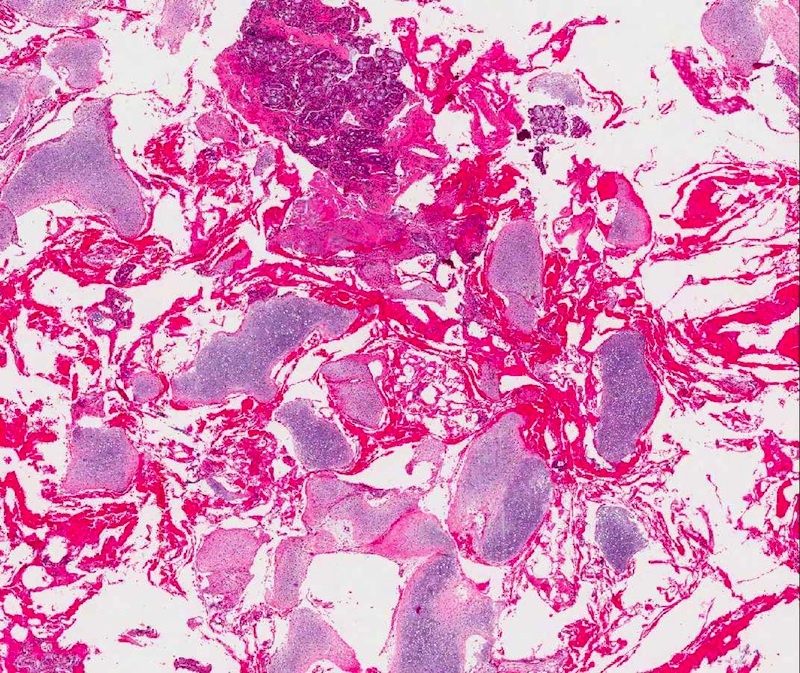 Electron microscopy shows fibroblastic and myofibroblastic differentiation. Surgical resection is usually curative, although it may be technically difficult because of the extent of disease. The first case of malignant transformation was recently reported (Histol Histopathol 2013;28:337).